Gosh, I can't believe it is February already, where has the time gone? Last time we posted was back in September and now 5 months have flown by. What's there to blog about? Well, Katie came to visit me (Carlleen) here in Idaho to do a training run. More posting about that later. For right now here is the biggest news of all. 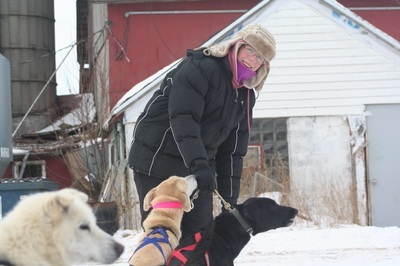 Katie is entered in the Junior Iditarod and leaves today to train for 2 weeks with a team she is using for it. Here is a short news clip about her leaving. 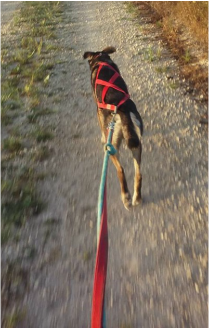 We hope to keep you updated as she continues training for the Junior Iditarod that happens in about 2 weeks! Hey KCM fans! As you all know, Katie entered in the Sled dog central September photo contest and while her photo didn't win, she did get an honorable mention and a chance to be a winner of the people's choice award voted by you! 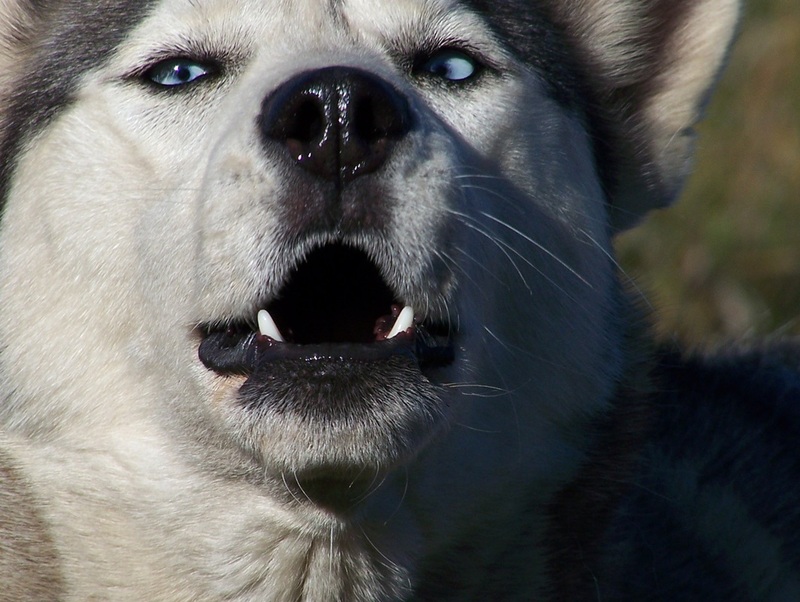 Carlleen also had 2 of her photos get selected, so head on over to Sled dog Central and check it out. Oh yeah... and in order to vote you have to create an account with Sled dog central and you get 3 votes! So, help KCM kennel's get a chance at winning some awesome prizes! Make sure you share this with your family and friends and vote for us please! P.S.The pictures you see are the pictures that have a chance of Winning People's choice award! When you vote... look for the names Carlleen Brehmer and Katherine Winrich! Thanks for your help! Links are posted to help guide you to the voting areas. Sorry this post is super late... blame Carlleen for that. She's gotten a bit on her plate lately and is now catching up with everything. Summer is over, or at least the vacation part of it. That means one thing, school is back in session. With each year I am always amazed that, over the summer, I somehow forget how much of my time school takes. As a result when school starts I am always shocked. Now the other thing about summer ending is that is it now dog running season, or at least it will be as soon as it is cool enough. As always I am very impatient at the beginning of the season to get out there and start running, but best safe than sorry. It is always best to wait until after the risk of over heating to start running the dogs, so for now we have logged no miles. Fall is also the time when the musher must check over their equipment. I guess we did a lot of beating on the ganglines last year because I no longer have enough to run a ten-dog team, only a six. The good news is that, thanks to my state fair check, I will be able to purchase new lines. Until then the dogs will simple have to be run in two smaller teams, which is what I would normally do at the beginning of the season anyways. 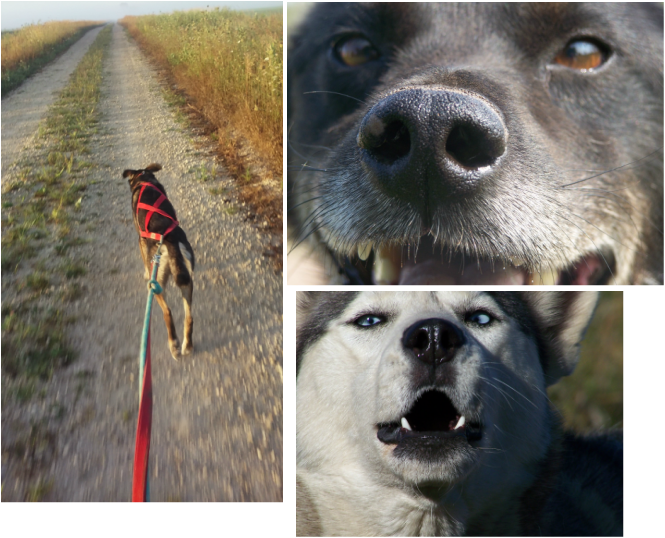 Finally, Sled dog central has sponsored a photo contest for the month of September. I've entered 3 photos in different categories. Those categories are young photographer, mobile, and the sled dog. I've attached the photos so you can see what I've entered. I guess that about sum up what is going on here right now, I will have another update shortly once we start running. To all the mushers who are having luck with the weather, happy trails. ​I am so excited, after having to wait an entire 5 months it is almost time to train the team again. True that means that school is right around the corner also, we go back on Thursday, but still training the team outweighs just about everything. The month of August has been a rather busy month for me. I am in 4-H and as most of you know I show at the fair, which is at the end of August. As a result I spend most of August doing last minute preparations on projects of all kinds. This year however there was one part of the fair showing that did not take place during fair week. That was the dog show which, as a mater of fact, took place two weeks before the fair. As I do nearly every year I showed at the dog show. This year I took Taruk again as he has been the dog I am training, currently. The first class of the day was Showmanship, one of my favorites. Taruk is not an incredibly showy dog, but he stacks really nicely without a lot of persuasion so he makes a good showmanship dog. I am entered in open showmanship because I have won in my age division in past years. The main two people who show in open showmanship are Heather and I. We trade off who wins nearly every year because our styles and abilities are nearly the same. This year after the judge had us do some rather complicated maneuvers Heather was picked as the winner while I placed second blue. The next class we were in was Novice obedience. I was an absolute wreck before going into the ring. I had never shown Novice before, and given that it is the first group where off leash work is used I had good reason to be nervous. Taruk surprised me, he behaved really well. True he lagged a little while heeling, but to be honest I expected him to take off out of the ring. He even did his recall, though he wouldn’t step over the chalk markers on the floor. In the end we took second place by only three points! What an accomplishment for our first time in Novice! And to tell the truth I am happy we didn’t win, this allows me another year to work him at this level so that he is ready when we move up again. The last class of the day was agility where Taruk surprised me again. We did both standard and Jumps, Tunnels, and Tables. In both classes we placed second, a huge improvement over last year when Taruk was jumping over tunnels and running around jumps. Overall I would say we have had a very successful season of training together, and I am excited for next year. However, it is now time to change gears and get to work in harness. Hopefully the weather will be nice to us and the next update will be about fall training. As you all know from my last post I recently went on a very long trip to pick up a new dog, Tornado. Well I figured you would all like to get to know him a little better, so without further udo, welcome Tornado. Tornado is an eight year old Alaskan Husky, though from my interactions with him he acts more like a four year old dog. I acquired him from John Perry a little under a month ago, so I have started to get to know him, but he hasn't really let me see his true colors yet. Overall Tornado is a very friendly dog, I have been slowly introducing him tot he rest of the team, and he seems to enjoy getting to know them all. Currently he is kenneled next to Racer, and they seems to appreciate each-others company. I have had a chance to run Tornado once, but it is summer so I really don't expect to get him in harness much more until sometime this fall. 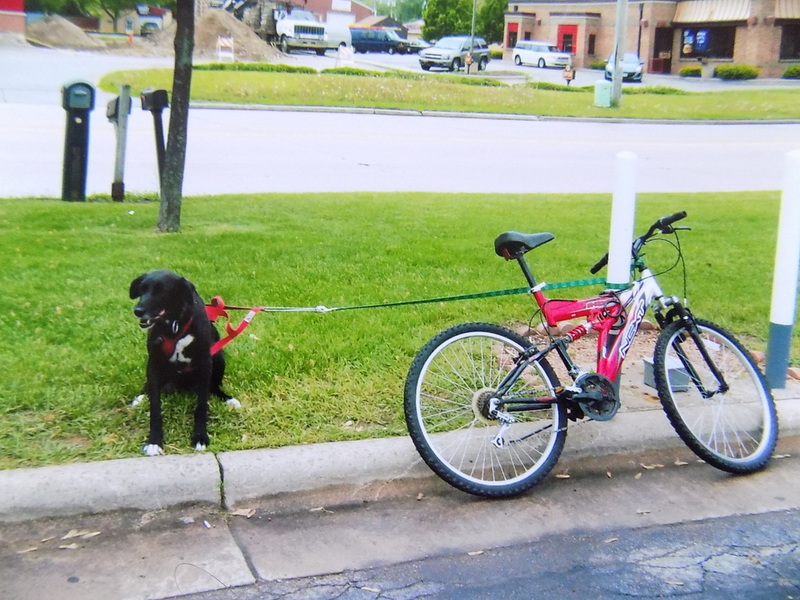 From what I have been told he is a wonderful lead dog, who can be hard headed at times, but that is not always a bad thing. Hard headed means that a dog can think for themselves, and does not always follow directions because they believe they know a better way. On the flip side, it means that they will not let the other leader, or the rest of the team, pull them off course once they have decided it is the correct path. Tornado is out of Jeff King breeding, and have hard headed dogs is common in that line. As far as build goes Tornado is unlike any other dog here. He has more of a hound build, but still has the thick coat of an Alaskan. He is smaller in size, with a long body and long legs. I would say he has a medium build, not thin like a sight hound, or stocky like a Malamute. Like so many sled dogs, he is that perfect combination of everything. Once the weather does finally cool off I will be working him on the bike with only one other dog at a time we can get accustom to each other, then I will start working him in the team. When I do start him in the team I will have him run in the middle of the pack, like all of my other dogs he will have to earn his place as a leader. I will do my best to keep you updated on how he adapts to live here at KCM kennels. With temps in the 50's this morning it was the perfect time to take Tornado out for his first run here. He is incredible, I ran him single, he has wonderful confidence and he has speed. I am so excited for this season. Come on weather cool down, I want to run more! P.S. The post on Tornado and the information about him will be posted in a day or two. Jon Perry, another junior musher, and I are friends, on Facebook because of distance, and he contacted me asking if I needed another good leader. Now a team can always use another good leader, considering we only have one steady command leader. So I told him I was interested. It took a fair amount of haggling, but eventually we got the details worked out and I sent him the check for Tornado. I sent the check ahead of time because it would be a few months before we had any free time to go over to Michigan and get Tornado. It finally happened on Saturday July 16th. I worked all day Friday, and then had another babysitting job that night until 9pm. After that I headed straight home where I managed to catch about two hours of sleep before I was awakened at 11:30pm to leave. My dad and I drove into Manitowoc to take the car ferry across lake Michigan. This was the first time I had ever ridden the car ferry. I have to say it is absolutely fascinating. We stood on one of the back decks and watched them load all the cars, disconnect from the dock, and then leave Manitowoc. Once we were out on the open lake it was smooth sailing. So Daddy and I decided to try to catch some Zzzz during the four hour boat ride. If we ever do this again we shall have to remember to bring pillows as benches are not the comfortable. Even with being uncomfortable I still managed to get a few hours of sleep, good thing to, I had a long day ahead of me. We arrived in Ludington, MI at 6 am local time (about 5 am our time), and thus stated our day of driving. Once getting out of the ferry area it was smooth sailing. I was the navigator, daddy drove, and we made great time due to lack of traffic. We arrived at Jon's place around 8:15, a little later than I wanted to, but traveling just takes time. Finally getting to meet Jon in person was great, we had talked for so long over Facebook. We discussed the upcoming race season, and our goals for the future. Finally he took me into the kennel to meet Tornado for the very first time. Though he may not be much to look at, Tornado has it where it counts. The grey on his muzzle is just another indicator of his wisdom that can only be earned with age. He got really excited when we walked him out to the van, thought he was going for a run, sorry to disappoint buddy, you are getting a very long day of traveling. The drive home was long and uneventful, yet somehow exhausting. We finally made it home late Saturday night. I situated Tornado for the night, and then hit the sack because I was completely and utterly exhausted. Stay tuned for our next post to learn more about Tornado! ﻿It is time to look at the upcoming season, and with us being a small kennel it sometimes means leaving dogs at home because of age or other factors. With that being said, I present you Sam. Sam has become to old for us to race and run with our younger team of dogs (he's 11). He's the oldest guy in the kennel but due to his age, we leave him at home. This isn't us being mean to him, it's just us doing it for his own good. Because the kennel size is a big factor, we would rather him go to a good home where he will get the love and attention he needs. He's some pictures of him in action when he was younger. 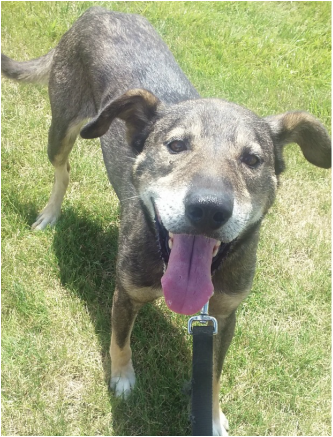 If you would like more information on Sam, check out the tab Dogs Available or click on this link and it will bring you there instead. 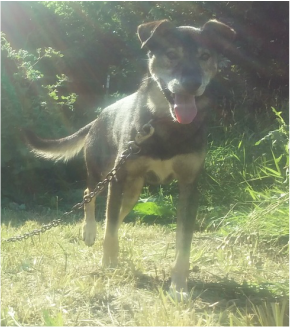 ​The dogs have been enjoying summer, as much as a sled dog can that is. They spend most of the day lounging around in the shade as they overheat quickly if they start moving. But in an effort to keep them from being to lazy I work them in Agility and Obedience, and we have been doing quite a bit of leader training. However, finding time to do this training is another story entirely. I am finally 16 and I have my license, which makes this the first summer that I can actually get a job. I have been doing pretty much any work I can get my hands on, babysitting, farm choirs, general labor, really anything. The thing with odd jobs though is odd work schedules that combined with the fact that I work 3 jobs a day has resulted in less time with the dogs than I would have liked. And I haven’t even gotten to the weather yet. The weather is, as expected, being summer in Wisconsin. In other words unpredictable, there are some morning when you need a sweatshirt to go to choirs and others where it is shorts and a tee shirt. Recently it has been the latter, with temps in the mid to upper 80s and high humidity it has been down right miserable. With these temps there is pretty much nothing I can do with the dogs other than give them plenty of water and shade. The one dog that I have to keep training, Taruk because he is showing at county fair, I have been forced to work either in the early morning or late evening after the sun goes down. Oh this weather really leaves me wishing for winter. In other news Daddy and I recently took a trip down to Oshkosh to pick up some fence that I found on Craigslist. I had been meaning to start working on fencing in the kennel for some time, and well the opportunity presented itself and I jumped on it. There is not enough fence to go all the way around the dogs so we have decided to place it on the north and east sides of the kennel. This will create a barrier on an additional two sides of the dogs to act as a wind break in the winter. The only side left open is the south side. Enjoy the Short Slide show of the dogs around the kennel below! On Saturday June 25, 2016 Taruk and I took a little road trip to the Sheboygan County 4-H fun match. We had learned about the event through our training group and thought it would be a great show to attend. For the first time ever I was attending a dog show all by my self. As I only got my license in May this was the longest solo trip I had ever done. Anyways, Taruk and I left early, six thirty in the morning, and started our drive. Daddy and I had carefully planned out the trip the night before, not that hard of a drive, I pretty much took three main north south roads the whole way. The drive was relatively uneventful until we got to Plymouth were the show was being held. Somehow I missed the road I was supposed to take to cut across town and ended up going way to the south side of town. After pulling over to have a look at the map, smart phones are great, I worked out a way back to the fair grounds, were the show was being held. As it turns out Taruk and I were the first competitors to arrive. I had budgeted more time for driving than I actually needed. We decided to sign up for Rally and Obedience as those are the two competitions he is the best at. It was only after registration had closed that I learned the show was not running in the order I had thought it was. They were starting with Agility and Showmanship first. This was unfortunate for me as I had to leave no latter than noon in order to get home in time for work. So we pulled out our chair and waited, not sure if we had driven down there for nothing. Much to my delight they decided to set up another ring and start the rally showing, and we were in the first class. Yay it looked like we would get to show after all. I walked the course and then went outside to warm up Taruk. I always like to do a few exercises before we go into the show ring just to get him focused. After I was sure Taruk was ready we went outside the ring to wait our turn. It didn’t take long and we were in the ring ready to begin. For some bizarre reason I get a nervous exited feeling when I show in rally, and as usual it happened here. I was shaking the whole time we were doing the course, but according to the rest of my group it was not noticeable. Taruk did amazing I couldn’t be happier with him. He listened to everything I said and was patience with me while I tried to direct him through exercises he had never seen before. We had a perfect run, until the very last sign. I was so close to being done that when I came to the last sign I didn’t take the time to read it through before starting. I made Taruk sit when I shouldn’t have and that cost us two points. In the end through Taruk finished with a qualifying score of 98 out of 100, really really go for his second time ever competing in Rally. After we finished showing we went and waited for the rest of the class, there were around sixteen dogs competing in my Rally class. Finally it was time for awards, we all went back into the ring. As usual they started from the bottom and worked their way to the top. With every number they called I got more and more excited that we had placed so high. When they finally called our number it was in second place! What a wonderful performance we had put in, and the best part is Taruk and I had fun. 2 sled dog racers keeping the public informed of their kennel updates!